Anna Vissi’s schedule in Amsterdam included interviews for a newspaper De Telegraf and a television station RTL and show Boulevard and a photo shoot. In Sweden Anna spoke to newspaper Expressen, news agencies JPSmedia and TT Spektra, newspapers Svenska Dagbladet and Aftonbladet, Sverige radio sr, Aftonbladet web TV, radio station SK Radio and TV channel Sveriges Television, for the show "Nojes Nytt", which will be aired a few days before the 20 May final and attended usual receptionhosted by the Greek Ambassador to Sweden. In Sarajevo Anna Vissi took part in Feminnem show along with Fabrizio Faniello from Malta and Severina from Croatia, she also gave interviews to a paper, a magazine and RTL television channel. Next Anna attended reception given by Greek ambassador to Bosnia, which was also attended by Fabrizio, Severina, Hari Mata Hari from Bosnia-Herzegovina, as well as his countryman Deen. One of the most beautiful moments of the night was when Anna, Fabrizio, Deen and Severina sang their ESC entries a capella. Next day Anna took part in the tapings of a TV show in the old quarter of the city. During a special event the Greek soldiers at the Budmir military camp bade farewell to Anna Vissi, who left for Brussels. During promo stay in Belgium Anna gave an interview to one of the country’s newspapers with the highest circulation, Hetlaatste Nieuws, interview to public French-speaking radio station RTBF and the programme "Vivacite", attended a reception at the Greek Embassy. Anna also met with Belgian ESC participant Kate Ryan in the Chocolate Museum. They then gave a Press Conference and took a walk at the most famous square in Brussels, the Grande Place. Then Anna Vissi attended a party in her honour at a major club in Brussels. Next stop of the promo-tour was Israel. The Greek singer attended a reception hosted by the Greek Embassy, gave interviews to the Israeli Media, and took part in a television show. Промо-тур Анны Висси в Амстердаме включал в себя интервью газете Де Телеграф, выступление в телешоу телеканала РТЛ Бульвар и фотосессию. После короткой остановки в Нидерландах Анна отправилась в Швецию. Расписание пребывания в Стокгольме включало интервью газетам Афтонбладет, Экспрессен, Свенска Дагбладет, радиостанциям, а также выступление на телешоу "Nojes Nytt", которое будет показано незадолго до самого конкурса. Также Анна посетила обычный для нее прием в посольстве Греции в Швеции. Следующей остановкой Анны стала Босния. В Сараево Анна приняла участие в шоу группы Феминнем, где вместе с ней выступили также Фабрицио Фаниелло из Мальты и Северина из Хорватии. На следующий день прошел прием в посольстве Греции. который помимо Анны, Фабрицио и Северины посетили также Боснийские участники Хари Мата Хари и Дин. Одним их наиболее запоминающихся моментов вечера стало исполнение певцами отрывков своих песен акапелла. На следующий день Анна приняла участие в съемке еще одной телепередачи, а также посетила военный лагерь, где пообщалась с греческими солдатами. После этого Анна отбыла в Брюссель. В Бельгии Анна дала интервью прессе, приняла участие в шоу телеканала РТБФ, посетила прием в посольстве. Анна также встретилась с бельгийской участницей Кейт Райан. Певицы вместе побывали в музее шоколада, дали совместную пресс-конференцию и прогулялись по крупной площади Брюсселя. Анна также приняла участие в вечеринке в ее честь в крупном клубе Брюселя. Следующей остановкой промо-тура Анны стал Израиль. Последовали интервью прессе, участие в телешоу и прием в посольстве. A pretty busy schedule awaited Anna Vissi in Serbia-Montenegro - interviews to National Broadcaster, visiting the stand of the Greek Businesses Association in an exhibition, where she met Crown Princess Katherine, wife of Alexnander Karageorgevich, next day - interview on morning show "Budilnik", where video clip of "Everything" was also broadcasted, shootings of special show that will be aired in May, interview to Pink TV, and reception in the residence of Greek Ambassador to Serbia-Montenegro. Anna also met with Luis, who participated in the Serbia-Montenegro national final with the band Flamingos. The trip of the Greek participant to Belgrade for the promotion of "Everything" was concluded with Anna Vissi’s performance on Pink TV show entitled Bravo. Next stop for Anna was Bucharest, Romania. Anna has performed on the TVR live show "Surprize Surprize", and also show "Danutz" which will be broadcast on Easter Sunday. Anna also gave interviews to the Romanian Media, attended a dinner hosted by the Greek Ambassador to Romania and performed at an open concert on Revolution Square. Trip continued in Madrid, Spain. It began with interviews to the press, radio, online resources. Anna Vissi was the guest of TV show "Sabado Noche" on TVE and show "Musica Uno", where she performed "Everything" and gave a mini interview. Follow trip of Anna Vissi in details at http://www.eurovisionathens.gr/en/ Напряженное расписание ждало Анну в очередной стране, которую она посетила - Сербии и Черногории - включая интервью национальному телевещателю, визит на греческий стенд на бизнес выставке, интервью утреннему шоу на телеканале RTS, съемки специального шоу, которое будет показано в Мае, интервью каналу PINK-TV, прием в посольстве Греции в Сербии и Черногории. Анна также встретилась с Луисом, который выступал с группой Фламинго на национальном Сербском отборе. Пребывании Анны в Белграде завершилось выступлением на шоу PINK-TV под названием Bravo. Следующей остановкой Анны был Бухарест, Румыния. Анна выступила в прямом эфире национального телеканала в шоу Surprize Surprize исполнив ряд своих лучших хитов, также она приняла участие в шоу Danutz, которое будет показано на Пасху. Анна дала интервью румынской прессе, посетила обед в ее честь, данный посольством Греции в Румынии и завершила свое пребывание в стране участием в концерте на площади Революции. Поездка Анны продолжилась в Мадриде, Испания. В начале Анна дала серию интервью радиостанциям, прессе и онлайн СМИ, а позднее приняла участие в шоу Sabado Noche и шоу Musica Uno на телеканале TVE, где она исполнила свою песню и дала мини интервью. 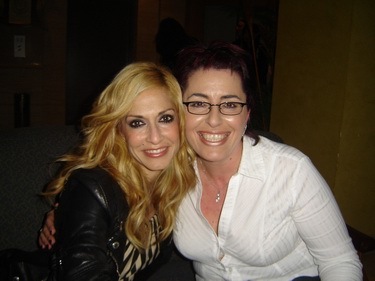 11.04 The next stop of Anna Vissi promo tour was Malta. Upon her arrival on the island, Maltese reporters and photographers gave Anna Vissi a warm welcome and then asked her to say a few words about the Eurovision Song Contest and "Everything." The day was full of interviews and performances and this is why interviews started early in the morning. The Maltese Culture and Tourism Minister has also welcomed Anna Vissi, while Fabrizio Faniello was hosting a party for the Greek delegation, where he presented his CD and video clip for his ESC entry. Anna also met with Malta’s representative to the 2005 ESC, Chiara, whose song "Angel" earned Malta second place. Anna gave an interview with the radio station Radio 101, while she appeared on NET television network. She then appeared on TV show "Eurovision Fever," which was dedicated to the leading European music contest, hosted by Claudette Pace. The next stop of Anna Vissi’s European promo-tour, following Moscow and Malta, was the island of Aphrodite. Anna’s schedule included an appearance at Nicosia’s most popular club, Zoo, where she performed "Everything" before the representatives of all Cypriot Media. She also gave an interview to RIK. Speaking to the journalists shortly before she appeared on Zoo’s stage, Anna Vissi went into petty details on what she will wear on the May 20 big final. As for her clothes on that day, Anna said that so far she has only contacted Jean Paul Gaultier, who was particularly happy with Anna’s decision to take part in the Eurovision Song Contest and willingly accepted the proposal to provide the clothing for the Greek delegation. And if you are curious about the choreography, Anna and her team are still working on the concept of the show she will perform in the final. However, since "Everything" being a rock ballad and dynamic in itself, she would not like to burden it with an overmuch choreography. Engulfed by the love of her homeland, Anna Vissi departed Cyprus and is continuing her European tour to promote "Everything". The next stop is Tirana, Albanian capital. Anna Vissi has appeared live at the music awards of TV Klan, and attended a dinner party hosted in her honour by the Greek Ambassador to Albania. She has also met with Archbishop Anastasios of Albania, and gave interviews to the country’s public television, as well as private Media. During the Press conference, the Greek performer voiced her joy over being in Albania. As she said, she had regretted not coming to the country earlier, seeing how much the people love her songs. In addition, she repeated her promise to return to Albania after the ESC, in order to give a concert, where she will not only sing in Greek and English, but also in Albanian. On Tuesday, "Everything" will travel and be heard in Serbia-Montenegro. Anna will sing at the music awards hosted by Pink TV, a private channel with the highest TV ratings in the country, and will talk to the Mass Media, while she will attend a live show by Pink TV on Wednesday night. On Thursday morning, the Greek star and her song "Everything" will make an appearance at the TV show "Surprize," while she will also be a guest in a show which will be taped and broadcast on Easter Sunday. Moreover, Anna will speak to the Romanian Mass Media and attend a dinner hosted by the Greek Ambassador. Follow detailed reports from Anna promo-tour at ERT site Следующией остановкой в туре Анны Висси была Мальта. В аэропорту ее уже встречали репортеры и фотографы, которые попросили Анну сказать несколько слов о конкурсе Евровидения и ее конкурсной песне. День был полон интервью и выступлений, которые начались буквально с самого утра. Анну принял министр культуры и туризма Мальты, а исполнитель Фабрицио Фаниелло провел вечеринку для греческой делегации, где он презентовал свой сингл и видеоклип на конкурсную песню. Анна встретилась также с мальтийской участницей 2005 Кьярой, чья песня "Ангел" смола завоевать для Мальты достойное второе место. Анна дала интервью радио 101 и выступила на телевидении NET. Она также приняла участие в регулярном шоу "Лихорадка Евровидения", ведушей которого выступает Клодетт Пач. После Москвы и Мальты певица направилась на остров Афродиты. Визит Анны включал в себя концерт в популярном ночном клубе "Зоопарк", где она исполнила свою конкурсную песню. Также Анна дала интервью государственному телевидению Кипра. Говоря с журналистами незадолго до концерта Анна раскрыла несколько секретов своего выступления на финале конкурса 20 мая. Анна сообщила, что подготовкой ее сценического костюма занимается популярный модельер Жан Поль Готье, который с радостью принял предложение от греческой делегации. Анна также сообщила, что работа над хореографией конкурса продолжается. Но так как "Everything" - это динамичная рок баллада, она бы не хотела перегружать ее сценической хореографией. После посещения своей родины Анна продолжила промо-тур в столице Албании, Тиране. Анна выступила на музыкальной премии телеканала Клан и принял участие в обеде в ее честь, который дал посол Греции в Албании. Она также встретилась с архиепископом Албании Анастасиосом, и дала ряд интервью государственным и частным средствам массовой информации. Во время пресс-конференции в Тиране Анна отметила, что она очень рада быть в этой стране, поражена поддержкой в ее адрес и жалеет, что не приехала сюда раньше, ведь как оказалось, многие любят здесь ее и ее песни. В дополнение, она обещала вернуться в Албанию после Евровидения для того, чтобы дать большой концерт, на котором она споет не только на греческом и английском - но и на албанском. Следующая плановая остановка певицы - Сербия и Черногория. Анна примет участие в церемонии вручения музыкальных премий телеканала Pink TV, наиболее популярного частного телеканала страны, выступит еще в одном шоу и побеседует со средствами массовой информации. Также она примет участие в шоу "Сюрприз", и еще одном шоу, которое будет показано на пасху. Анна также посетит обед в ее честь в посольстве Греции. Upon arrival in Moscow, representatives from the country’s Media were waiting to take interviews and photos. The Greek delegation will stay in Moscow until Thursday, while Anna’s schedule includes interviews and live appearances, aiming at getting the Russian audiences acquainted with the Greek song. As for the weather in Moscow, let us just say that the Russian capital is covered in snow, while the temperature is quite low, somewhere around -5 degrees Celsius. However, the Greek delegation’s high spirits, as well as the melodic accompaniment of "Everything" is the best recipe for a warm climate amid this freezing scenery! Greek popstar met with the Russian participant to the Athens ESC, Dima Bilan. Anna warmly welcomed Dima, who visited her joined by known Russian pop singer Philip Kirkorov. The topic of discussion was none other than the Athens ESC and the two performers’ songs. Besides, both Anna and Dima will sing a ballad in the upcoming Eurovision Song Contest. In fact, they talked about the special features of each song that will make them stand out. Anna wished Dima and his song "Never Let You Go" all the best in the Athens Eurovision Song Contest, while Dima gave Anna and "Everything" his warmest wishes. Anna Vissi has also visited the International Tourism Exhibition in Moscow and of course the Greek stand. Tens of visitors, exhibitors and employees in the exhibition rushed to enjoy Anna and hum to the song, with which the performer will represent Greece in the 51st Eurovision Song Contest! The exhibition centre was filled with enthusiasm and the applause was unstoppable, just as the good luck wishes! Anna thanked the crowds for the warm welcome and invited them to attend the European music celebration, which for the first time will be hosted in Athens. Philip Kirkorov said a few words about the ultimate Greek pop star and asked the Russians to support Greece with their vote in the ESC! Anna also visited the Cypriot stand in the exhibition. Shortly after her visit to the International Tourism Exhibition, the Greek pop icon gave two more interviews for the morning shows hosted by the two major Russian channels, namely Channel One and Centre TV. In the first show, she appeared along with Russia’s entry in the Eurovision Song Contest Dima Bilan, who is also to sing a ballad. The Greek singer told the Russian performer that she hopes Greece will award him with ten points, the second highest score, since the twelve points are awarded to Cyprus by tradition. The interview reached its peak when Anna and Dima sang a cappella the refrains of their songs, "Everything" and "Never Let You Go." And from Channel One to Centre TV for yet another interview! In that case, apart from Anna’s participation in the ESC, her course in the music arena was brought to light, so that the Russian public gets better acquainted with her. What she herself underlined was her love and passion for music. As for the Eurovision Song Contest, she argued that she sees it as a great music festival rather than a contest! Besides, as she noted, the best of each country are those who have booked a ticket for the big final. Therefore, they all are winners. The Greek pop star sang her song, "Everything," which the show’s presenter really enjoyed. The Greek promo tour’s first stop in Moscow concluded at the reception at the Greek Embassy in Moscow on the occasion of Greece’s National Independence Day on 25 March. The highlight of the evening was the appearance of reigning European basketball champion Thodoris Papaloukas, who plays for CSSK Moscow. Сегодня, 22 марта в 13.00-13.15 на стенде Греции на туристической выставке MITT в Экспоцентре на Красной Пресне в рамках своего промо-тура выступит Анна Висси. Вход на выставку по билетам начнется с 13.00. По приезду в Москву Анну встретили представители Российской прессы. Греческая делегация будет оставаться в Москве до четверга, у Анны запланирован ряд интервью и выступлений, нацеленных на презентацию греческой песни российской аудитории. Что же касается московской погоды, то мы можем отметить, что вся столица России покрыта снегом, достаточно холодно, примерно минус пять градусов Цельсия. Однако, Греческая делегация находится в приподнятом настроение и мелодичные ритмы песни "Everything" стали лучшим рецептом для создания теплого климата несмотря на холодную погоду. Греческая поп-звезда встретилась с Российским представителем на Евровидении Димой Биланом. Анна тепло поприветствовала Диму, который посетил ее вместе с известным российским исполнителем Филиппом Киркоровым. Они поговорили о Евровидении в Афинах и о песнях обоих участников. Как оказалось, и Анна и Дима исполнят мощные баллады на Евровидении 2006. Также они обсудили, какие особенности их песен помогут им выделиться на общем фоне. Анна пожелала Диме и его песне "Never Let You Go" всего лучшего на Евровидении в Афинах, Дима в свою очередь пожелал всего лучшего Анне и ее песне "Everything". Анна также посетила международную туристическую выставку в Москве и выступила в греческой секции. Десятки постетителей и работников выставки поспешили послулушать выступление Анна и познакомиться с песней, которая представит Грецию на Евровидении 2006. Выставочный центр был наполнен энтузиазмом и апплодисменты, как и пожелания удачи, не прекрашались. Анна поблагодарила всех за теплый прием и пригласила всех в Афины на конкурс. Филипп Киркоров также сказал несколько теплых слов в адрес греческой звезды и попросил Россиян голосовать за Грецию на Евровидении 2006! Также Анна посетила киприотскую секцию выставки. Вскоре после посещения выставки Греческая звезда дала два интервью двум крупнейшим телеканалам России: Первому каналу и ТВ Центр. В первом шоу, записи для передачи Доброе Утро, с Анной принимал участие Российский участник - Дима Билан. Греческая исполнительница заметила, что желает, чтобы Россия получила вторую по величине высшую оценку от Греческих телезрителей, ведь 12 баллов несомненно уйдет Кипру! В окончании интервью Анна и Дима исполнили акапелла припевы своих конкурсных песен "Everything" и "Never Let You Go". Следующее интервью состоялось на ТВЦ. В этом случае, помимо участия Анны в Евровидении состоялась беседа и о ее общей карьере, что позволило российским телезрителям поближе познакомиться с греческой певицей. Анна сообщила, что ее страсть - это любовь к музыке. Конкурс Евровидение она рассматривает скорее как крупный музыкальный фестиваль а не соревнование. Она сказала, что победители - уже все участники Евровидения, ведь они смогли пройти через тяжелый отбор на родине. Греческая исполнительница также исполнила свою конкурсную песню, к удовольствию телеведущей передачи. В среду также были даны еще ряд интервью прессе, участие в нескольких других ТВ шоу, а также Анна посетила прием в посольстве Греции в России, в честь дня Греции, который отмечается 25го марта. "A Beautiful Night", "Who Cares about Love" and "Welcome to the Party" are pop songs, while "Everything" is a ballad. "A Beautiful Night", "Who Cares about Love" и "Welcome to the Party" - быстрые песни, а "Everything" - баллада. Дополнительная информация - страница Греции. Greek broadcaster MAD TV claimed that 4 songs have already been chosen for Anna Vissi and Greek preselection final. The titles given "Welcome To The Party" by Dimitris Kondopoulos and "Beautiful Night" by Pegasus and also two unnamed songs by Nikos Karvelas. Official confirmation from ERT was not yet received. Согласно греческой телекомпании MAD TV уже отобраны четыре песни, которые исполнит Анна Висси на Греческом национальном отборе. Названия и авторы упоминаются следующие: "Welcome To The Party" - Dimitris Kondopoulos and "Beautiful Night" - Pegasus, а также две неназванные песни композитора Nikos Karvelas. Официального подтверждения от организаторов отбора пока не получено. Anna Vissi was officially presented to press as Greek representative. She has commented to be overjoyed with ERT’s proposal, and described her participation as a "pleasant responsibility", since she is stress-free. However, she noted that she will do her best for a top spot, while she voiced the belief that Athens’ Eurovision Song Contest will be the best ever organised. At the same time she expressed the hope that more Eurovision Contests will be hosted in Greece in the future. Anna said that she wanted an upbeat and optimistic song, which the audience will be able to follow. She also said that she hoped numerous great songs are found, which she will be happy to perform for the people during the national selection which is scheduled for March 14, who have always been by her side, while she stressed that it would be very important for the song to be accompanied by an impressive setting and an intricate dance routine. Referring to Nikos Karvelas, she said he is an excellent composer, but it did not concern her whether he will be the one composing the song she will be singing on OAKA’s stage. No songs have been selected yet, ERT is still in the process of choosing. Winner will be chosen most probably by mix of 60% televoting, 40% of jury. Anna’s journey in Europe, i.e. her promo tour, will pass from over 12 countries and will commence immediately after the national final, scheduled for sometime between the end of February and the beginning of March. Анна Висси была представлена прессе в качестве греческого участника. Она рассказала, что была очень рада приглашению со стороны ЕРТ и описала свое участие как "приятную ответственность", поскольку на нее не будет никакого давления. Она однако отметила, что приложит все свои силы для того чтобы занять первое место, и выразила надежду, что в будущем еще несколько конкурсов Евровидения пройдут в Греции и Евровидение в Афинах станет лучшим за всю историю. Анна также сообщила, что хотела бы исполнить быстротемповую и оптимистичную песню, которая бы пришлась по душе зрителям. Она также надеется, что будет выбрано несколько качественных песен, которые она сможет исполнить перед публикой на национальном отборе, который пройдет 14 марта. По словам Анны, очень важно, чтобы песня сопровождалась шоу представлением и танцевальной постановкой. По вопросу о участии ее бывшего мужа Никоса Карвеласа в качестве композитора Анна сообщила, что для нее не является важным, будет ли он автором ее конкурсной песни, но считает его подходящим кандидатом. В настоящее время еще ни одна песня не была отобрана и утверждена греческим телеканалом. Песня-победитель скорее всего будет избрана 60% телеголосованием, 40% голосованием жюри. Промо тур Анны по Европе затронет 12 стран и начнется сразу после нацилнлаьного отбора, который намечено провести в конце февраля - начале марта. 24.01 Greek broadcaster ERT has spread official news today that Anna Vissi will be representing Greece in the 51st Eurovision Song Contest, which will take place in Athens. ERT has been searching for a Greek artist with international fame with the aim to win Eurovision 2006 and leave the contest in Greece for one more year. Obvious choice was Greek superstar Anna Vissi, but negotiations with her took a long time for several reasons, main of them was that singer wished her ESC song to be written by her ex-husband Nikos Karvelas, and ERT was proposing to hold an open submission contest for composers. "She is a top Greek pop singer and will represent Greece at the 51st Eurovision, Song Contest which will be hosted in Athens for the first time ever! All the talk is about Anna Vissi, who, as officially announced by ERT, will represent Greece in the final on May 20. The popular performer will once again participate in the top Song Contest, ready, as always, to give her best and amaze Greek and foreign audiences in a way she only knows how!" 48 year old Anna Vissi has represented Greece at Eurovision 1980 and Cyprus at Eurovision 1982. Soon it will be revealed how Greek song selection will take place, but it is expected that it will be done through open selection, with 3-5 songs taking part, as it was last year. Греческая телекомпания ЕРТ подтвердила в официальном бюллетне, что Анна Висси представит Грецию на конкурсе Евровидение 2006, который пройдет в столице Греции, Афинах. ЕРТ долгое время искало греческого артиста с международной известностью с целью вновь одержать победу на Евровидении 2006 и оставить конкурс в Греции еще на один год. Однако переговоры с Анной затянулись по той причине, что певица хотела бы исполнить на конкурсе песню Никоса Карвеласа, а ЕРТ хотело бы объявить открытый сбор заявок от композиторов. "Она самая известная греческая певица и она представит Грецию на 51м Евровидении, которое впервые пройдет в Афинах, столице Греции. Все это - о Анне Висси, которая, как официально объявляет ЕРТ, представит Грецию в финале конкурса, который пройдет 20го мая. Популярная певица вновь возвращается в популярный конкурс, и она готова, как обычно, отдать все свои силы и поразить греческую и иностранную аудиторию только ей одной известным способом!" 48 летняя Анна Висси уже представляла Грецию на Евровидении 1980 и Кипр на Евровидении 1982. В ближайшее время станет известно, каким образом пройдет выбор песни, но приоритетным вариантом является открытый концерт с 3-5 песнями-кандидатами (как в прошлом году). Anna Vissi was born in the town of Larnaca, Cyprus. She started studying music at the age of 6 at a local conservatory, while she was singing from 5 years old, every Sunday in a place for children, where she used to go with her family. She participated with her older sister, Lia, in a competition for new talents, saying she was 14 although she was 12. Two years later, she was the main singer at Y. Kotsonis opus Ayia Tilliria, which was also her first TV appearance. In 1973, her family moved to Athens, where she continued her studies in the National Conservatory and also appeared with many well-known singers, such as Yorgos Dalaras, Haris Alexiou, and Vasilis Papakonstandinou, in the famous night places of Plaka, in Athens. At the same time she was simultaneously studying law at the University of Athens. In the meantime, she collaborated with many important Greek composers such as Mikis Theodorakis (1974/5), George Hadjinassios (1974), Doros Giorgiadis (1974), Nikos Karvelas (1975, who later became her husband) and Mihalis Terzis (1976). In 1977 she went on tour with Yorgos Dalaras and Haris Alexiou, giving remarkable concerts with the most famous at Rainbow, London (June). In the same year, she won the prize for best singer and best song (As Kanoume Apopse mia Arhi) of the year at the Annual Song Festival of Salonica (Palai des Spor). In 1978 she was proposed by ERT (Greek National Television) to represent Greece at the 23rd Eurovision Song Contest. There were two songs to select from — Poso S'Agapo and Mr. Nobel. Finally, due to controversies between the composers of the songs, her participation was disqualified and Tania Tsanaklidou went to the contest. In 1980, Anna took place at the 25th Eurovision Song Contest representing Greece with the song Autostop and finishes 13th. Two years later, she represented her native Cyprus at the 27th ESC with the song Mono i Agapi, which ended 5th with 85 points. In 1983 she married Nikos Karvelas, a very talented composer, with whom she collaborated in 1975. After their marriage, she started a close collaboration with her husband. Since 1975, all her releases have become gold or platinum and Anna has been (along with Yorgos Dalaras and Haris Alexiou) one of the top selling Greek artists. In 1986, she participated at the Cypriot National Final for Eurovision Song Contest, with the song Thelo na Gino Star, taking second place. This song is still unreleased today. Some of her most successful albums include I Epomeni Kinisi, Tora, Empnevsi, Fotia. In 1989 she made her debut as a radio producer on ANT1 Radio. Her radio program had the title of one of her songs Ta Koritsia Ine Atakta (Girls Are Naughty) and was aired every weekend. In the same year she participated with the song Kleo at the Greek National Final for Eurovision Song Contest, ending second. In the early 90s, she was the first (after famous singer Marinela) to mount spectacular shows in Greece (along with her husband Nikos Karvelas) starting with her appearances at Diogenis Pallace and then at Rex (presenting the famous Anna Vissi Show). In November 1991, a big dream of Anna and Nikos came into being. It was Demones, the first Greek rock opera. It was based on a libretto by Stavros Sideras and staged at Atticon Theatre in Athens, for two years. Roger Williams was the director and Anna Vissi (queen, Rozanne), Yannis Samsiaris (Daniel), and John Modinos (inquisitor) were the leading actors. Critics were flattering while Demones was played on foreign TV stations and attracted the attention of Broadway agents. A year later in October 1993, she had the leading role of Aphrodite, in the one act opera Ode to the Gods by Stavros Sideras. It was held only once in Limassol, Cyprus, during the celebrations for the Commonwealth Day. The then-president of the Republic of Cyprus, Glafkos Kleridis, and Queen Elizabeth II, were amongst the audience. The following years Nikos and Anna released albums that became gold and platinum. They included Lampo! with Latino influences, Emis, Live!, Re!, O! Kypros with traditional Cypriot songs. In 1994 she was the hostess on the ANT1 weekly TV show Me Agapi, Anna (With Love, Anna), while one year after she did a concert in Cyprus, supporting the defenses of the island. In 1996 Anna released the double platinum album Klima Tropiko. After giving more than 40 successful concerts all over Greece, she mounted a spectacular, three-hour show at the club, Gazi. She is one of the the most successful one-woman performer-artists in Greece. On New Year's Eve, by invitation of the Mayor of the city of Athens, she performed in the Parliament Square in front of more than 20,000 people and all of Greece, via TV. In the same year a new album was released called Travma that became gold in less than two weeks and three times platinum in only six months. In 1998, she released a new Greek album called Antidoto, that sold more than 80,000 copies in just a week. This broke all the previous records. She then gave a sold-out charity concert at the Presidential Palace in Cyprus and continued with two sold-out concerts in London, in February 1999 (Forum Music Theatre, Palladium Theatre). There was also a mini tour in the USA, giving concerts in Los Angeles, Atlantic City, Chicago, Boston and New York (Madison Square Garden). In April 2000, she performed at London's Royal Albert Hall, at the so-called 'millennium show', with her own magical way of singing full of passion and energy, in front of people from Sony International, marketing managers from Europe, and fans from the UK. In May 2000, she performed as a special guest star in Cyprus, at the 49th annual Miss Universe Pageant which took place at the Eleftheria Stadium in Nicosia. She sang for the very first time her song "On A Night Like This"(that became a worldwide hit by Kylie Minogue), in front of a huge live international audience around the world. Some months later, her first international single was released called Everything I Am, containing the original version and three remixes of the song (Almighty Mix, Eiffel 65 RMX, Groove Brothers Remix), and a song in Greek and English lyrics called Moro Mou, No Tomorrow. She also filmed her first video clip of that single, directed by Antti Jokinen (Solar films, Finland), that costed 80,000,000 drachmas (310,000 dollars). Apart from the English single, she also released a new Greek single called Agapi Ypervoliki, containing six new songs. Having sold more than 75,000 copies in just 10 short weeks, it became triple platinum and finally five times platinum, selling more than 100,000 copies. To promote the single, she presented a unique show for the Greek standards at Asteria Club with husband Nikos Karvelas and the boy band ONE, with Shaun Fernandez as the choreographer. In September 2000, she gave a charity concert at the GSP Stadium in Nicosia, in front of 12,000 people, with ONE and a group of dancers from Sony International. She sang songs from the very beginning of her career to her current carrier (1973-2001). The same year he released her international English language album called Everything I Am which although started as ambition effort to launch an international career it failed to chart in the US. It contained 12 songs by Russ Ballard, Mark Taylor, Graham Stack, Steve Torch, Paul Stanley, Tina Shafer, Julian Harris, Danielle Gerber and of-course her husband, Nikos Karvelas. Producers of the album were Brian Rawling (Cher, Enrique Iglesias), Ric Wake (Celine Dion) and Peter Asher (Linda Ronstadt, Diana Ross, Cher). In Greece, after a week, the album reached gold status (20,000 copies +), while Australia, South Africa, Spain, Italy, France, Germany, Turkey, Finland, Norway, and Asia started to promote it. In November 2000 her new Greek album was released, entitled Kravyi, reaching double platinum status in just a couple of hours, and breaking all the records. It finally became 7x Platinum -- a double album with 24 new songs and a duet with Keti Garbi. Some months later, she started presenting a show with Keti and the boyband ONE in Fever Club, while she accepted the invitation of the Mayor of Athens to perform in the Parliament Square, at the celebrations of the New Year's Eve 2001. Just before Easter, a second single from her international album was released. It was called Still in Love with You with remixes (Radio Edit, Soda Club Radio Mix, Soda Club Mix, Soda Club TV Track) and production by Brian Rawling. In June 2001 she was the main singer in a spectacular production in Bucharest (Unirii square, nearby river Dambovitei) along with the No Smoking band and the famous cinema director and producer Emir Kusturica. The concert (2001, Peace Odyssey) included a multimedia show, opening with a water screen that wowed more than 150,000 people who were present, marrying music with the most modern expression of art. Kusturica along with producer and director Angelos Hadjiandreou undertook the artistic direction of the event. Three months later (3rd September) she gave a concert in Cyprus (GSP Stadium), singing and dancing in front of more than 18,000 viewers, for more than three hours. Just a day before, she was awarded for the seven times platinum Kravyi. She described her next step as the 'diamond' of her career, a challenge she set to conquer, searching for new expressional dimensions. The music theatre Mala, i Mousiki tou Anemou, based on a true love story that took place during World War II in Auschwitz, between Mala Zimetbaum and Edward Galinski. The play, which was staged at Pallace Theatre in Athens (19th of Jannuary 2002), was written by her husband Nikos Karvelas, directed by Yannis Kakleas and accompanied by a symphony orchestra conducted by Yorgos Niarhos. The next year she was in Fever Club in Athens, performing with one of the most important Greek singer, Yannis Parios ('the singer of love') with whom she had already collaborated in the late 70s. There, she promoted her new album with producer George De Angelis. In September 2003, she gave another sold-out concert in Cyprus, at the Tzirion Stadium in Limassol, with songs from her 30 years career. Also, she was awarded with a prize for her whole contribution from the Cyprus Paraolympic Organization, while a square in Larnaca was named after her. She also met and talked with the president of the Republic of Cyprus, in the Presidential Palace, in Nicosia. Just before 2004, her new album was released called Paraxenes Ikones. To promote the album, she started appearing in Diogenis Studio, with Konstandinos Christoforou, Nino and Hi-5. On the 31st March 2004, she performed in the Liberty Square (in Nicosia), at a concert part of the celebrations for Cyprus's entry at the European Union, after an official invitation from the Republic of Cyprus. In May 2004 she went on a small tour in England and USA, with Lambis Livieratos (with whom she collaborated back in the early 90s), while in July her album Paraxenes Ikones was re-released with a bonus CD single called The Remixes. On 29th August 2004 she performed at the closing ceremony of the XXVIII Olympiad, in Athens. She then gave a concert in Cyprus on 3rd September, at the GSP Stadium in Nicosia, where she sang for the first time her new English song called Call Me (the English version of her Greek dance hit Ise). After that concert she moved to the USA, for the preparation and promotion of her single Call Me that has been included in the playlists of major radio stations, both in USA and Europe. In the Billboard Charts of USA, the single which features twelve remixes, went to number 1 on the Billboard Hot Dance Music Club Play chart. During the winter and through to the summer of 2005, Anna went around to clubs as apart of her Mini-USA Tour. Anna has since released a new Greek Album called Nylon which is the first dual disc ever to be released in Greece. Many dual discs have been released worldwide, by major artists. On a dual disc, one side acts as a CD and the other as a DVD. The CD that includes rock, dance, ballads and hip hop, was released in both a regular CD version and a dual disc version. On the CD Anna has a duet with the lead singer of the hip-hop group Goin' Through called Erota i Polemo. She is said to be releasing a new International English Album in spring 2006. The CD will be a USA release and not an export(from Greece). It will include songs such as Call Me, an English version of her Greek hit Agapi Ypervoliki called Desire, and an English version of another Greek hit Eho Tosi Agapi called Love For Real. Анна Висси родилась в городе Ларнака, на Кипре. Она начала заниматься музыкой в возрасте 6 лет в местной консерватории, хотя пела с 5 лет, каждое воскресение на детской площадке, куда она ходила вместе с родителями. Она участвовала со своей старшей сестрой Лией в отборе молодых талантов, сказав, что ей уже исполнилось 14 лет, хотя ей было всего 12. Два года спустя Анна принимает участие в телепостановке опуса Ayia Tilliria, что стало ее первым появлением на телевидении. В 1973м году ее семья перебирается в Афины, где она продолжает учиться в консерватории и выступает со многими известными исполнителями, такими как Йоргос Даларас, Харис Алексиу и Василис Папаконстандину, в наиболее популярных ночных клубах Афин. В тоже время она учится на юридическом факультете Афинского университета. Параллельно она сотрудничает с известными греческими композиторами Микисом Теодоракисом (1974/5), Георгисом Хаджинассиосом (1974), Доросом Гиоргиадисом (1974), Никосом Карвеласом (1975, который позже стал ее мужем) и Михалисом Терцисом (1976). В 1977 году она принимает участие в туре с Йогосом Даларасом и Харис Алексиу, давая концерты с известными исполнителями, в том числе и в Лондоне. В том же году она получает приз как лучшая певица, и за лучшую песню (As Kanoume Apopse mia Arhi) на фестивале в Салониках. В 1978 году греческая телекомпания ЕРТ предлагает ей принять участие в конкурсе Евровидение. Ей предоставляют на выбор две песни Poso S'Agapo и Mr. Nobel, но в конце концов из-за споров между композиторами песен, вместо Анны в конкурсе участвует Таня Цанаклиду. В 1980 году Анна наконец принимает участие в Евровидении, представляя Грецию с песней Autostop и занимает 13 место. Два года спустя, она представляет свой родной Кипр с песней Mono i Agapi, заняв 5е место. В апреле 2000 года Анна выступает с "шоу тысячелетия" в Лондонском Альберт-Холле, на котором присутствовают менеджеры студии Сони Интернейшнл. В Мае 2000 года Анна выступает в качестве специальной гостьи на 49й ежегодной премии Мисс Вселенная, которая проходила на стадионе Элефтерия в Никосии. Она впервые исполняет песню "On A Night Like This" (которая впоследствии станет мировым хитом в исполнении Кайли Миноуг) перед аудиторией телезрителей по всему миру. Анна издает новый греческий альбом под названием Nylon, одна из сторон которого - это CD, а другая DVD. Альбом включает в себя песни в стилях рок, данс, баллады и хип-хоп. Анна исполняет также дуэт с солистом хип-хоп группы Goin' Through под названием Erota i Polemo. Ожидается, что ее новый международный альбом выйдет весной 2006 года. В него войдут песни Call Me, английская версия песни Agapi Ypervoliki под названием Desire, а также версия песни Eho Tosi Agapi под названием Love For Real.